Using this as the blueprint, Nordic Innovation House is opening in Hong Kong, bridging Nordic innovation and technology startups to Hong Kong, the Greater Bay Area and Asia’s most important markets. The Honourable Mrs Carrie Lam, the Chief Executive of Hong Kong SAR, Ms Anne Berner - Minister of Transport & Communication and Nordic Cooperation of Finland, Ms Ann Linde - Minister of EU Affairs and Trade of Sweden, Mr Dagfinn Høybråten - Secretary General of the Nordic Council of Ministers, and other distinguished guests will be present during the inauguration at PMQ Hong Kong, symbolizing Hong Kong’s accessibility to Nordic innovation as a gateway towards Asia! The triple helix of government-academia-private partnership and world-class educational systems have resulted in heavy investment in R&D. Together with a non-hierarchical tradition of openness and transparency, this has cultivated the remote region, which has a freezing winter and a sparsely combined population of only 27 million people, to become extraordinary innovative. Since the 1990s, Nordic governments have invested heavily in their technology infrastructure, nurturing a generation of people who grew up with the Internet that creates a culture of open access and entrepreneurial collaboration. Innovation is closely linked to research and development; Sweden and Finland are two of Europe’s top spenders in this area, Sweden for example, invested 3.3% of GDP in R&D in 2017. Compared to the EU-wide target of 3% of GDP investment by 2020, Nordic countries are clearly leading the way. 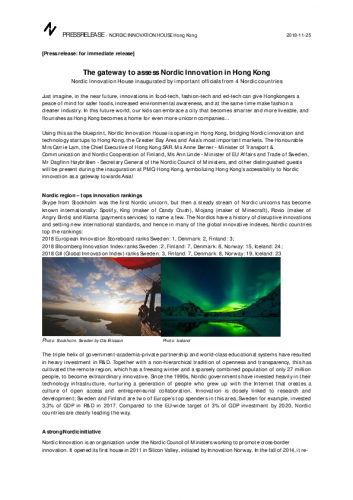 Nordic Innovation is an organization under the Nordic Council of Ministers working to promote cross-border innovation. It opened its first house in 2011 in Silicon Valley, initiated by Innovation Norway. In the fall of 2014, it re-launched as Nordic Innovation House and displayed an exceptional example of five Nordic countries coming together over shared values and interests, to take Nordic innovations to the global arena. In Hong Kong, four countries are founding partners to the House: Finland, Iceland, Norway and Sweden. It’s the 4th Nordic Innovation House after Silicon Valley, New York and Singapore. Nordic Innovation House will target to bridge the Nordics’ outstanding innovations in life science, clean-tech, ed-tech and smart city to suit Hong Hong’s strategy of being a world-class innovation hub and smart city. According to Hong Kong’s strengths, the Nordic Innovation House Hong Kong will also open up opportunities for social innovation and design. Being the most open and international city in the Greater Bay Area, Hong Kong has a unique position by having its international know-how and at the same time having mainland China as its back-bone. Nordic Innovation House will strive to encourage more Nordic Innovative startups to use the Chinese market as their prototype test market for demand in Asia, by leveraging resources from Hong Kong and the Greater Bay Area to incubate innovation and technology. We believe more unicorn companies will be established HERE in the very near future.